Authorities in Indiana have arrested a suspect wanted in connection with a double murder that occurred last June in Danville. Public Safety Director Larry Thomason says Deontae Bright was arrested Friday morning. ‘’Mr. Bright was being sought in connection with the homicide that occurred at the Untouchable Motorcycle Club in June of 2018,’’ said Thomason. ‘’Danville detectives, acting on information provided by a tip through Crimestoppers, provided information to the Indianapolis Metro Police and US Marshal’s Office who took Mr. Bright into custody without incident in the Indianapolis area,’’ added Thomason. Bright remains in custody in Indiana and is awaiting extradition to Illinois. Bright was 18-years-old at the time of the incident last June. 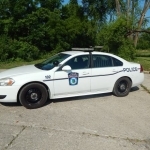 Vermilion County Coroner Jane McFadden identified the two shooting victims last June as 17-year-old Tahji S. McGill and 23-year-old Albert L. Gardner, Jr., both of Danville. Both died from gunshot wounds. The June 2018 incident remains under investigation.